According to the last national census (2011), Canadians spent an average of 51 minutes inside their car, commuting to and from work each day. That’s roughly one hour a day, five times a week. Driving to work isn’t the only thing we use our vehicles for either. We run errands, grab groceries, go for dinner, take trips… In actuality, five hours is only a small fraction of the amount of time we end up spending inside the car each week. With all this time spent on four wheels, we can’t afford to be disconnected from the outside world anymore while we’re driving. Whether you’re a parent taking the kids to school or an urban professional racing across the city; you need to be in-tune with what’s happening in your social environment. With this in mind, automakers have been refining their vehicle’s technology to meet the increasingly mobile –centric needs of their customers. 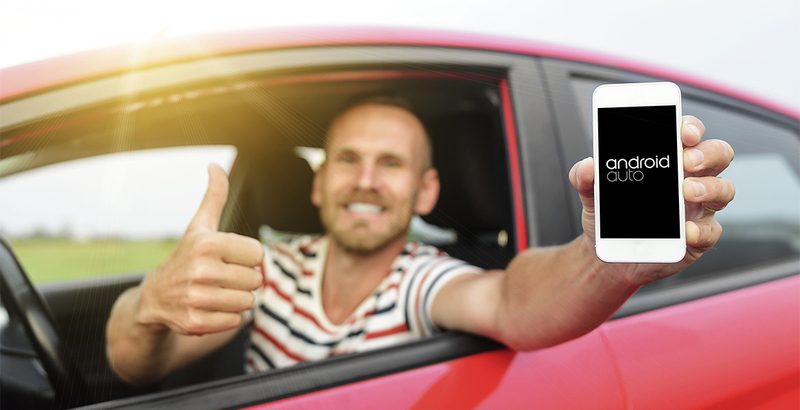 And although these needs are highly diverse (and sometimes competing), there’s a general consensus that being able to use your phone, mid-drive, is an absolute necessity. That’s why Google created Android Auto. It’s a program designed for smartphones* and that can be run in vehicles through the headboard’s media unit. Google’s Main Goal? To provide the utmost accessibility, while still keeping drivers focused and safe on the road. * Must use the Android operating system version 5.0 Lollipop and later. Android Auto puts all the things you need from your phone in one specific place. That means everything from your contacts to email, music, driving applications and more, all easy-to-find and activated solely by voice command. Navigation? Google maps will bring you to your destination with voice-guided directions. It will also provide live traffic updates, lane suggestions and more. Music? Android Auto offers 90 days of Google Play Music for free, for first-time users. This way you have access to an unlimited amount of music, ad-free, while on the road. Text, call or email? You can do all of these things, as well as receive messages and still keep your hands planted firmly on the wheel. Everything is voice activated. Applications? Simply say the apps name and it’ll come up for you, ready to use. Android Auto has a comprehensive list of available apps, including Skype, iHeart Radio, Kik, Spotify and Talkray. In the past, you needed a compatible vehicle or aftermarket radio and an Android phone operating 5.0 Lollipop or higher to run Android Auto. For a full list of the brands and models that Android Auto is compatible with click here. However, Google announced just last week that this will be changing. Android Auto will soon be able to run entirely on your phone while still offering the same features as if it were connected to your vehicle’s dash. This isn’t the only thing that’s changing, either. Android is getting some new features and some new apps. Waze, an increasingly popular, community-driven traffic and navigational app, will now be an option for those who prefer it to Google Maps. You’ll also be able to say “OK Google” to activate Android Auto, as opposed to pushing a button (this is often referred to as “hotwording.”) As well, the latest version of the automotive app will give you the ability to sync a compatible infotainment system through a vehicle’s built-in WiFi network. It’s connectivity at it’s finest. Google will also be allowing car manufacturers the opportunity to create their own software for car-related tasks (like requesting roadside assistance) without ever having to leave the Google automotive program. Hyundai, the first powerhouse to adopt Android Auto will be releasing one later this year, as will Honda. The most exciting takeaway here is obviously the ability to run Android Auto on your phone, regardless of the make or model of your vehicle. That means that even if you’re stuck driving a beater, you can still enjoy Auto’s voice controlled media features, superior navigational program, and hands-free messaging system. Posting a Facebook status, sending a text, reading an email… These are no longer activities reserved for still-land. These are things that people want to be able to do from the driver’s seat. Android Auto is Google’s attempt at allowing a person to be safely “plugged in” on the road, without actually being plugged in. If you don’t want to wait for these changes to take effect, take a look at the list of vehicles that are Android Auto compatible. Then check our extensive inventory for the brands and models you’re interested in. Have a question? Leave it in the comments section below!